With Casa Lasso the Ecuador-based architecture firm, Rama Estudio has come up with a passive building based on traditional tradecraft and using local materials. 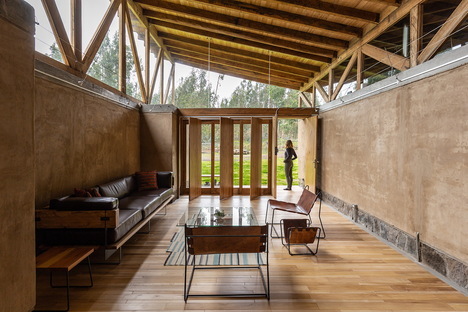 With Casa Lasso the Ecuador-based architecture firm, Rama Estudio has come up with a passive building based on traditional tradecraft and using local materials. A house that fosters age-old construction systems, adding a contemporary look in a unique backdrop. Cotopaxi is a province of Ecuador in the central Andes region of the country and takes its name from the 5897 m-high Cotopaxi Volcano, known for its perfect cone shape. Cotopaxi’s páramo ecosystem - a kind of alpine tundra, a neo-tropical form of plant life - is typical of the South American Andes and is home to a wide variety of flora and fauna. The páramo ecosystem is located above the tree line, between about 3200 and 4800 m asl in a hot and humid zone. A landscape like this required the young team of architects from Rama Estudio to come up with a well-considered project that would meet the client brief: to build a family house as a place to get away, relax and enjoy in their spare time. The land is part of the San José hacienda in Lasso, in the middle of a rural environment. So the design team decided to limit the impact of the house by going with passive architecture, first and foremost based on local traditions and materials, and putting plenty of emphasis on the tradecraft. This project really reinforces that aspect, expanding the concept of sustainability to embrace the social sphere as well. The building's bearing structure is formed of 40-cm thick rammed earth walls, made by packing a mixture of earth, aggregates, lime and water into wooden formwork and known as tapial. These protect the house from the gale-force winds in the zone and the solid facade improves the home's indoor climate. On the other hand, the interior walls are mobile partitions formed of a sequence of pivoting wood panels so the large open space can be configured to meet the needs of the occupants and the amount of air circulating inside can be controlled. Rama Estudio has transformed the buttresses in the thick walls into niches and has embedded utilities like the kitchen, bunk beds and storage, resolving the issue of space elegantly and with a minimalist style. 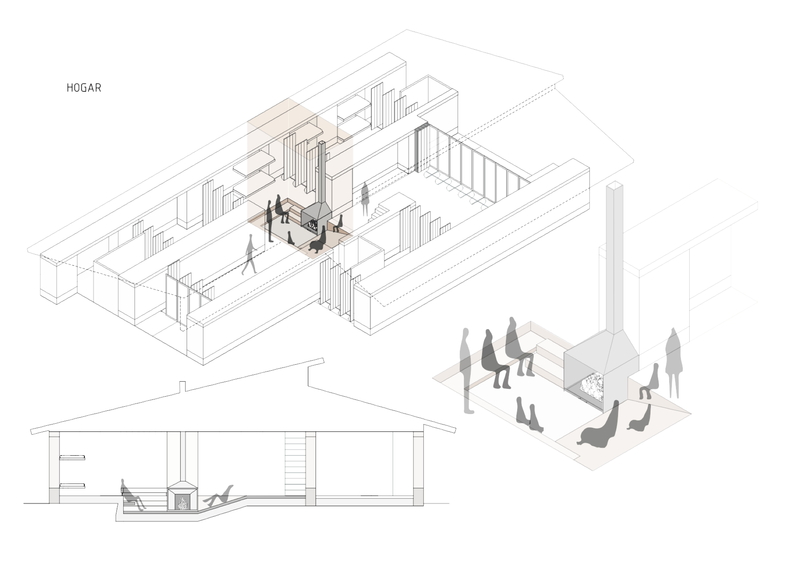 A mezzanine level accommodates a small attic with great views of the surrounding landscape. 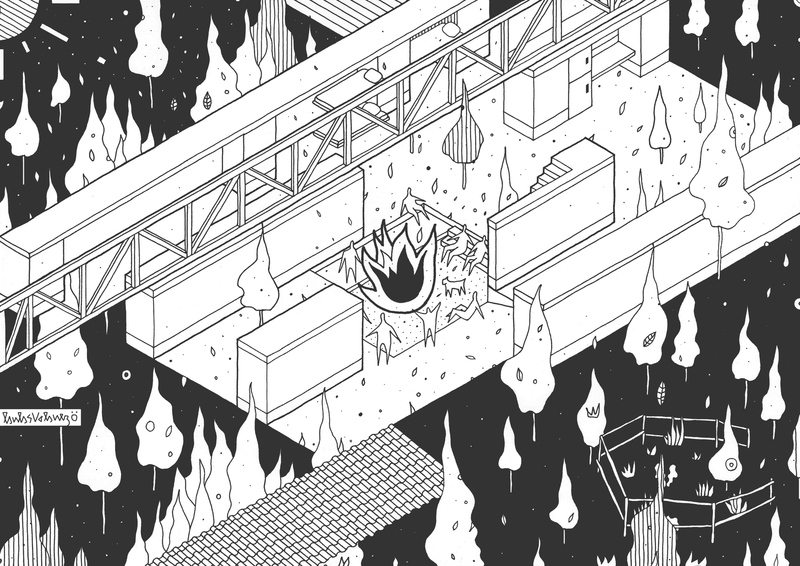 Inside Casa Lasso, everything rotates around the fireplace that dominates the living zone - it's a real hearth where the family can come together. 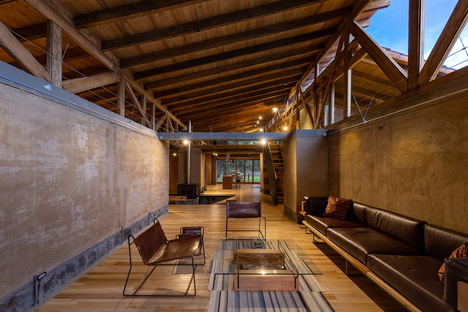 The warm hues of the rammed earth go really well with the colours of the wood used on the floor and the large wooden crossbeams that hold up a large, very asymmetrical gable roof. In addition to using only local labour and materials, in order to minimise the home's environmental impact, it also has a water treatment system - just one more way of underscoring the sustainable aspects of this architecture project. Even the native plantings around the house have been designed to gradually eliminate the eucalypts that have eroded the soil. 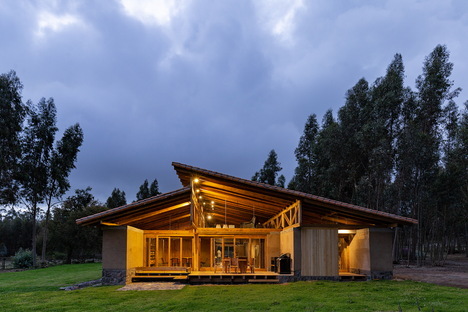 Caso Lasso by Rama Estudio is yet another addition to the continuous stream of fine quality architecture in Ecuador, which skilfully brings together elements of tradition with great attention to the surroundings, coming up with attractive and sustainable solutions.